It was the first day of a new year, what shall it be? Is it going to be the same of old stuff or a brand new start? Well, this year was a bit different. For starters, had a quiet New Year’s eve at home, alcohol free, or almost alcohol free. Opened a bottle of Red which was a gift from I am not sure who and found it to be oxidised and a bit sour. Normally, I would still downed the bottle or mixed in with some fruit juice into instant Sangria but this time, the entire contents ended up in the sink. Decided to do something different for New Year Day and decided to check out Kota Damansara Forest Reserve. Heard about, seen some events about but had absolutely no idea where it is. After cruising for more than 30 minutes around Kota Damansara, we finally found some obscure brown signs which led us to it. The best advice I could give to anyone who wants to look for this place is that it is in Section 10 of Kota Damansara and it is right in front of the Kota Damansara Section 10 school. It was 2 pm when we arrived and saw the field which appeared in some event pictures which we have seen. The trail starts beyond the edge of the field. Checked with a couple of guys who were waiting at the car park for their friends and was informed that there are a number of different trails but all colour coded with the longest about 4 km. 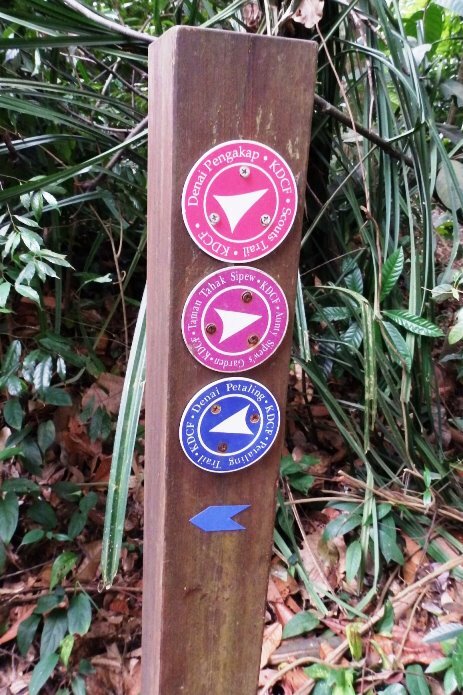 Sounds fun and we immediately proceeded for our first trek of Kota Damansara Forest Reserve. The first trail we encountered is the Scout trail. Four hundred meters into the trail, it meets up with the Temuan trail. The Temuan trails moves further away from the entrance and we decided to take it. The terrain is flat with some mild inclines. Ground solid and foliage thick giving the trail a very cool jungle feel. After another kilometre, we come across another intersection leading to the Sahabat trail. This trail heads North towards Sg Buluh, we decided to stick to the Temuan trail which veered East. One more kilometre down the trail, we re-joined the scout trail. Soon we reached the back fences of some bungalows and before we knew it, we were near the exit. Came across another intersection for Petaling trail and the sign says that it is about one kilometre. Gave it a miss and we were out of the forest reserve. The exit was at the side a pond filled with many weekend anglers hoping to get some catch and some 200 meters from the entrance where we parked our car. 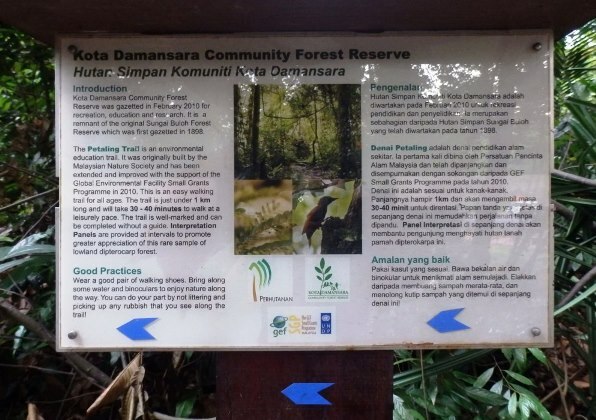 Overall, I would rate Kota Damansara Forest Reserve to be the best place to orientate beginners to jungle trails as the trail is very easy and relaxing. Basically elementary trekking and enjoyable but with one negative factor. One has to be watch out for the trail bikers. Will try the Sahabat Trail, the next time I visit KDFR. Believe that Sahabat would be a much longer than 4 km. 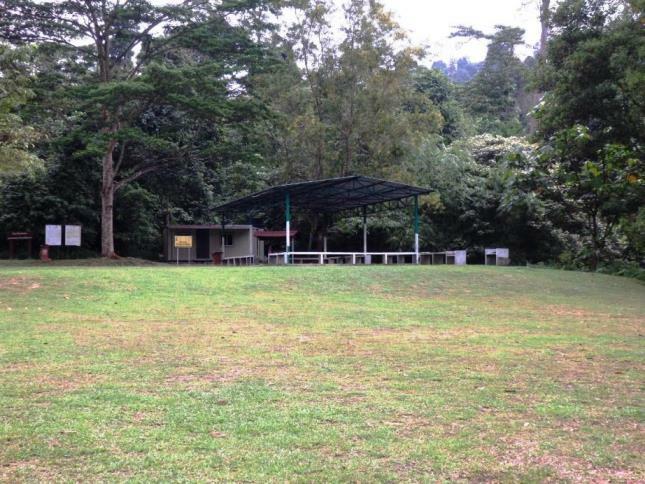 This entry was posted in Hiking, Nature, Trekking and tagged KL forest, Kota Damansara Forest Reserve, Nature, Trekking. Bookmark the permalink.